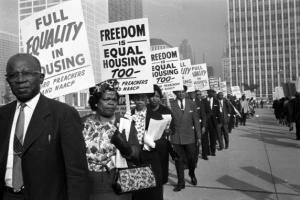 WASHINGTON (AP) - The Supreme Court agreed Monday to take on another dispute involving race, deciding whether people must prove they were victims of intentional housing discrimination to win lawsuits under federal law. With highly anticipated decisions on affirmative action and voting rights imminent, the justices added a case to their calendar for the fall that involves the Fair Housing Act. The act bars discrimination on the basis of race, among other categories, in residential property sales and rentals. The issue in the case is whether it is enough to show that a practice has a disproportionate effect on a group or whether there must be proof of intent to discriminate. The outcome also could affect other laws, including one that prohibits discrimination in lending and is enforced by the Consumer Financial Protection Bureau. African-American and Hispanic residents of a neighborhood pegged for demolition and redevelopment in Mount Holly, N.J., sued to block the project, saying it targeted a predominantly minority area. Unlike other anti-discrimination laws, the housing act does not explicitly cover disparate impact claims. The housing law prohibits discrimination in all sorts of transactions involving real estate and applies to banks and mortgage companies as well as governments, like the one involved in this case. The Obama administration strongly supports judging discrimination claims on the basis of results, as well as intent. It tried to ward off high court review by telling the justices that the Housing and Urban Development Department has recently adopted a new regulation to deal with the sorts of claims at issue in the case and that no federal appeals court has yet addressed the new rule. The administration also said that 11 federal appeals courts have held that the law does allow for claims based on the results of a project or practice, not just intentional discrimination. The case will be heard by a court that once before agreed to settle the issue. In addition, one justice, Antonin Scalia, has questioned whether the Constitution allows for disparate impact claims, even when discrimination laws explicitly authorize them. Scalia has said judging a practice by its effect, rather than intent, could be hard to reconcile with the Constitution's promise of equal protection. The justices originally agreed to take up the housing issue in 2011 in a case from St. Paul, Minn., questioning whether the city's enforcement of its housing code in low-cost rentals disproportionately occupied by African-Americans violated the fair housing law. But Justice Department lawyer Thomas Perez, now nominated to serve as Labor secretary, prevailed on St. Paul to withdraw its appeal because the outcome could have harmed the department's approach to housing discrimination cases. Republicans have criticized Perez for his role in a deal between the department and St. Paul that also kept the federal government out of two whistleblower lawsuits against the city that could have returned millions of dollars in damages to the federal government. Residents of the Mount Holly Gardens neighborhood have had a long-running legal dispute with Mount Holly Township over the fate of their homes. By the late 1990s, the neighborhood of brick row homes built in the 1950s for veterans was known for blight and crime. Absentee landlords were often blamed. In 2002, the township government declared the area to be in need of redevelopment and came up with a plan to raze the 329 homes to make way for apartments, townhouses and stores. A residents group, Mount Holly Citizens in Action, sued, saying they were being forced out of the neighborhood because they would not be able to afford to live in the new housing that was planned. They also said that the plan was discriminatory because three-fourths of the residents were minorities. In 2011, the 3rd U.S. Circuit Court of Appeals in Philadelphia agreed that the residents had made enough of a claim to go to trial on the disparate impact of the township's plan. But the court also found that there was insufficient evidence of intentional discrimination. The redevelopment has not happened yet, though most of the old homes have been knocked down, leaving only 60. The owners of 25 of them have asked the local government to settle the case with some saying they would accept homes in the new development and others asking for money. The case, Township of Mount Holly v. Mount Holly Gardens Citizens in Action, 11-1507, will be argued in the fall. Associated Press writer Geoff Mulvihill contributed to this report from Haddonfield, N.J.